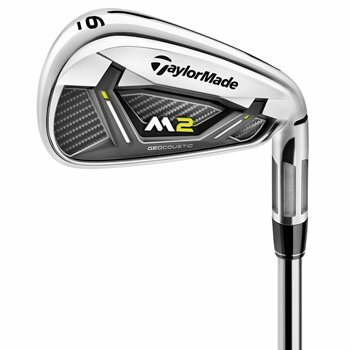 The TaylorMade M2 2017 iron set features materials and technologies that combine metalwood like launch conditions with class leading shot height for maximum distance, without sacrificing forgiveness. The large, unsupported, thin face and new Speed Pocket allow ball speeds that push the limits of distance performance in an iron. By employing weight saving technology like the L shaped toe design, 360° undercut, and the new thick-thin fluted hosel, the ultra-low CG gives the ability to utilize stronger lofts without losing peak trajectory and playability. The M2 2017 is now equipped with Face Slots, which limit loss of ball speed on mis-hits low on the clubface, which ensures you experience the ultimate forgiveness on every shot. Review by Tim, 1 year ago. Review by A_cook98, 1 year ago. Review by Jschall, 1 year ago. Can these irons be altered for length and lie angle. Such as 2 degrees upright lie and 1/2 inch longer. There is no difference between a Gap wedge and an Alternative wedge. Different manufactures just use different terms for a wedge (typically 50-52 degrees) to fill the loft gap between a Pitching wedge and a Sand wedge. how many clubs are there? how much for all? why is it more than original? Maybe, are they in good shape? how bad of condition are these clubs?